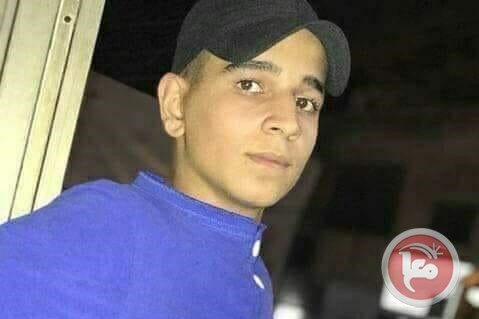 RAMALLAH (Ma’an) — A 16-year-old Palestinian was shot and killed by Israeli forces during clashes that erupted in the al-Jalazun refugee camp north of al-Bireh in the central occupied West Bank, on Friday evening. The Palestinian Ministry of Health confirmed that a Palestinian from the al-Jalazun refugee camp arrived to the Palestine Medical Center in a critical condition. Sources added that the teen was injured with live bullets in the abdomen. The ministry identified the killed teen as Mahmoud Youssef Nakhleh. Israeli forces opened fire at the teen from a very close range; from less than 10 meters away. Israeli soldiers attempted to detain Nakhleh afterwards, however, Palestinian Red Crescent paramedics were able to take him and transfer him to the Palestine Medical Center after having to quarrel Israeli soldiers for more than 30 minutes. Nakhleh was later pronounced dead at the hospital. What goes through the head of soldiers, young Israelis, after they shoot an unarmed Palestinian teenager in the back with live ammunition, prevent him from getting medical treatment, move him around, putting him on the ground and then picking him up again – and chase away an ambulance at gunpoint? For 15 minutes, the Israel Defense Forces soldiers carried the dying Mahmoud Nakhle , pulling him by his hands and feet, it’s not clear why or where, before allowing him to be evacuated. They had already shot him and wounded him badly. He was dying. Why not let the Palestinian ambulance that arrived at the site rush him to the hospital and possibly save his life? Nakhle died from a bullet in his liver and loss of blood. He was two weeks after his 18th birthday, the only son of parents who are descendants of refugees, and he lived in the Jalazun refugee camp adjacent to Ramallah, in the West Bank. Nakhle was killed last Friday, December 14. Getting to Jalazun took a long time this week; it was a long and stressful trip. Overnight, terror attacks and other sights of the intifada had returned simultaneously: innumerable surprise checkpoints, such as we hadn’t seen for years; long lines of Palestinian vehicles, forced to wait for hours; drivers emerging from their cars and waiting in desperation by the side of the road, anger and frustration etched on their faces; roads blocked arbitrarily, with people signaling each other as to which was open and which was closed; some cars making their way cross-country via boulder-strewn areas and dirt paths to bypass the roadblocks, until those options, too, were sealed off by the army. And also aggressive, edgy, frightened soldiers, carrying weapons that threatened just about anyone who made a move near them. Welcome back to the days of the intifada, welcome to a trip into the past: Even if only for a moment, the West Bank this week regressed 15 years, to the start of the millennium. The wind blows cold at the Jalazun camp. A throng of thousands of children and teenagers is streaming down the road, heading home from their schools run by UNRWA, the United Nations refugee agency. The two schools, one for boys and one for girls, are situated at the camp’s entrance, on both sides of the main Ramallah-Nablus road. We were here a year and a half ago, after IDF soldiers shot up a car stolen from Israel when it stopped outside the settlement of Beit El, spraying it with at least 10 rounds, and killing two of its passengers. About half a year ago, we returned to the camp to meet Mohammed Nakhle, the bereaved father of 16-year-old Jassem, one of those fatalities. The father cried through our entire meeting, even though this was a year after he had lost Jassem. Mahmoud Nakhle, who was killed last week, was a relative of Jassem’s. Last Friday, there was stone throwing in the valley between Jalazun’s boys’ school and the first houses of Beit El, across the way. The soldiers fired tear-gas canisters and rubber-coated bullets at the young Palestinians. Quite a few of the camp’s residents have been killed at this spot, which has become a main arena of the struggle against the large, veteran settlement that looms through every window in poverty-stricken, overcrowded Jalazun, situated below. The stone throwing had slowed down in the afternoon and had just about stopped when an IDF force, arriving in two vehicles, began chasing after the youths, who were now on their way back to the camp, at about 4 P.M. The latter numbered about 15 teens, aged 14 to 18. Suddenly the soldiers started shooting, using live ammunition – even as calm was apparently about to be restored. A video clip, one of several that captured the event, shows the soldiers walking along the road and firing into the air. The wail of an ambulance slashes the air now, as we stand at the site of the incident with Iyad Hadad, a field investigator for the Israeli human-rights organization B’Tselem, who collected testimony from eyewitnesses. Nakhle chose to return home by way of a dirt path that passes above the camp. The soldiers ran after him and one of them shot him once, in the lower back. Nakhle fell to the ground, bleeding. The occupant of the first-floor apartment in the closest building in Jalazun, just meters from the site of the incident, heard the shot, the groans and a call for help. She assumed someone had been wounded, but wasn’t sure where or who he was. From her window she saw a group of soldiers standing in a circle, though she couldn’t see the wounded person who lay on the ground between them. A second eyewitness saw one soldier nudge Nakhle with his foot, apparently to see if the teen was still alive. They then pulled up his shirt and pulled down his pants, apparently to check whether the stone-throwing youth was a dangerous, booby-trapped terrorist. As the video accounts show, he was left lying like that, exposed in his blue underwear. The woman from the apartment rushed out to summon help, but the soldiers fired toward her to drive her off. One bullet struck her husband’s car. The soldiers lifted Nakhle up and carried him a few dozen meters from where he’d fallen, laying him down at the side of the road. One of the eyewitnesses related that they carried him “like you haul a slaughtered sheep.” The video clip shows them carrying him not in the prescribed way for moving someone who is seriously wounded, but by his hands and his feet, his back sagging. After five to seven minutes, the soldiers again lifted Nakhle, once more by his extremities, and carried him a few dozen meters more, in the direction of the main road, and again laid him by the roadside. A Palestinian ambulance that had arrived at the scene was chased off by the soldiers, who threatened the driver with their rifles. As far as is known, the soldiers did not give Nakhle any sort of medical aid. The woman from the house again shouted, now from her window: “In God’s name, let the ambulance take him away.” But still to no avail. It was only after a quarter of an hour, during which Nakhle continued to bleed, that the soldiers allowed an ambulance to be summoned. A video clip shows Nakhle raising one hand limply to the back of his neck, proof that he was still alive. Half-naked, he’s placed on a stretcher and put in the ambulance, which speeds off, its siren wailing, to the Government Hospital in Ramallah. The teen apparently breathed his last en route, arriving at the hospital with no pulse. Attempts were made to resuscitate him in the ER and to perform emergency surgery, but after half an hour, he was pronounced dead. Dr. Muayad Bader, a physician in the hospital, wrote on the death certificate that Mahmoud Nakhle died from loss of blood after a bullet entered his lower back, struck his liver and hit a main artery, damaging other internal organs. A group of children is now standing at the site where Nakhle fell, practicing stone throwing on the way back from school. They hurl the stones to the ground in a demonstrative fit of anger. In the mourning tent that was erected in the courtyard of the camp, adorned with huge posters of the deceased, the men sit, grim-faced, with the bereaved father, Yusuf Nakhle, 41, in the center. Disabled from birth, he is partially paralyzed in his left arm and leg. We asked him to tell us about Mahmoud’s life. “What life? He hadn’t yet lived his life, they robbed him of his life,” he replies softly. Mahmoud attended school until the 10th grade and then studied electrical engineering at a professional college in Qalandiyah. He completed his studies and afterward a year of apprenticeship, and was waiting to find a job as an electrician. His father was waiting for him to help provide for the family. Yusuf is a technician at a pharmaceuticals company in Bir Zeit, near Ramallah. He and his wife, Ismahan, 45, have two more daughters, aged 14 and 4. Mahmoud was their only son. In response to an inquiry, the IDF Spokesman’s Office gave Haaretz the following statement this week: “On December 14, 2018, there was a violent disturbance adjacent to Jalazun, during which dozens of Palestinians threw rocks at IDF soldiers. The soldiers responded with demonstration-dispersal measures. The spokesman’s office did not respond to a question regarding the denial of medical assistance to Mahmoud Nahle. Last Friday, the hours passed normally in the home of Nakhle family in the Jalazun camp. Breakfast, a shower; the son asks his father if he needs anything before going out around midday. Never to return. At 4:30, Yusuf’s brother called to inform him that his son had been wounded and was in the Government Hospital. By the time his father arrived, Mahmoud had been pronounced dead. “We are human beings and it is our right to live and to look after our children. We too have feelings, like all people,” says Rabah, Mahmoud’s uncle, the brother of his father. Yusuf has watched the video clips that document the shooting and the hauling of his dying son dozens of times, over and over. Ismahan can’t bring herself to look at them.